Breaking Dawn Part One, The Movie: Bloodier Than Ever"
Have you ever wished there was a book on the occult written from a Christian viewpoint, with suggestions on how to talk about this to your kids or teens? Well, such a book now exists, SpellBound: The Paranormal Seduction of Today's Kids. Marcia Montenegro was asked by Cook to write this book as a guide for parents and other interested adults. The book covers what exactly the occult is, how it's being packaged and marketed in our culture, and how to talk to children and teens about the occult. It can now be pre-ordered on some book sites. The book's information comes from Marcia's many years of participation in New Age, Eastern, and occult beliefs; her practice as a professional astrologer for 8 of those years, including teaching astrology; extensive reading and research of New Age and occult materials; and experiences and contacts she had in the New Age/occult community for over 15 years. Additionally, since becoming a Christian, Marcia's knowledge in these areas has been supplemented by her contacts, reading, and research through her ministry, CANA/Christian Answers for the New Age. Since 1994, she has written on these topics for Christian periodicals, has been interviewed on radio shows and for publications, and has lectured on these areas around the country. "The time for discernment is upon us. Marcia Montenegro has written a biblically based, culturally relevant, and very insightful book to help us in this discernment. Every Christian home needs it. I highly recommend SpellBound." SpellBound and an interview of Marcia was featured in the May 2007 Reasoning from the Scriptures Newsletter by Dr. Ron Rhodes, Author and President of Reasoning from the Scriptures. 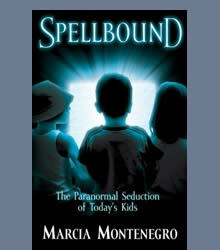 SpellBound is also found on the websites for Lifeway, Books-A-Million, Parable, and others. PART ONE: What Is the Paranormal and Why Is It A Threat to Our Kids? Chapter 7 Who Are the Psychics and Can They Help? Chapter 8 Divination - Not Divine! Chapter 14 The Ouija Board: Dialing for Danger? Copyright © 1999 - 2012 Marcia Montenegro. All rights reserved. Site by xSynthesis.